We may be a bit late to the party, but don't act like you even knew this was a thing. 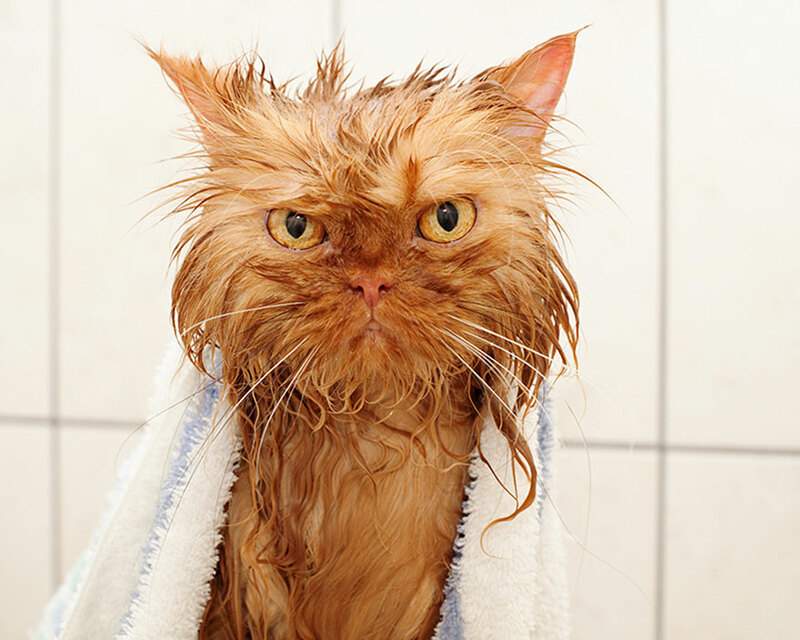 Anyway, now that we are all aware that September 1st belongs to the gingery kitties of the world, we have no choice but to shower them with love. Ginger-colored cats apparently get a day all to themselves, so clearly they are indeed the most special cats in the world. Do you fiery-colored felines...do you. This majestic furbeast knows that it's kind of a big deal. Not every cat gets away with that kind of posture, but this guy here can. He knows that he has got it going on, Ginger-cats are very confident like that. Of all the kitties, they are the most comfortable in their own fur. I get you ginger-mom. Kids, kittens, they are all the same. None of them have any concept of personal space. Motherhood is kind of the same across all species. Offsprings will crawl all over you and lick you in strange places just because. Sigh. 14 Lay off me, Debbie! Even a ginger-cat has an off day. Clearly, this guy is struggling today. Cats and water never make a fab combo. This cat's owner is not permanently on his naughty list. Expect dead mice in your slippers fella. Ginger cats aren't quick to forgive and forget. Sure, ginger cats are pretty chill when generally speaking, but occasionally they get turned up. When they do, they look like this guy. No more catnip for you. Obviously, you have no sense of limits when it comes to that stuff. Diet starts Monday, guys! Just kidding. 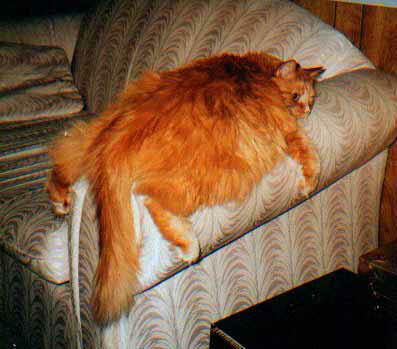 Ginger kitties are totally fine with packing on the pounds. Again, they know they're special. They aren't about to let a few pounds get in the way of being fabulous. Besides, their entire life consists of eating and lying on window sills. That is something that you can do no matter how overweight you are. If your heart is not bursting with love by merely looking at this, then trust me when I say that you have no soul. Look at this little furball of love! Why are we all not bolting to the nearest animal shelter and adopting all the baby gingers that we can get our hands on? I wonder if obsessing with little ginger cats is an actual mental illness? If it is, leave me to my sickness. This guy knows what his primary purpose in life is, and we are not about to stop him. His days consist of laying on furniture for extended periods of time and being awesome. It's not a vast resume that he is rocking, but the things he does...he does well darn it! Not all kitties are blessed with the fiery fur that makes them automatically impressive. Sure a world of little ginger-beasts is something many of us dream of, but let's face the facts: it is not ever going to be a reality. 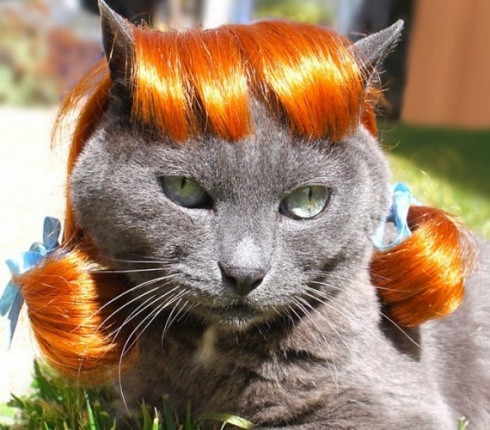 This feline might not have been graced with the gingery genes, but that small detail is not about to stop them from joining the ranks of the worst kitties on the planet. Point for trying pal. We aren't judging. We aren't exactly sure what happened here. 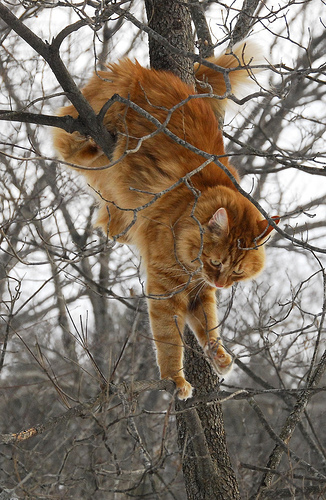 How did your mellow fellow go from being part of the actual couch to finding himself stuck up in a tree? It's beyond us. Anyway somebody grab a ladder and shimmy up there to rescue our friend and return him to his rightful place on earth: the armrest of the living room couch. Errr. Close, but no cigar my friend. I'm pretty sure you have this all twisted. 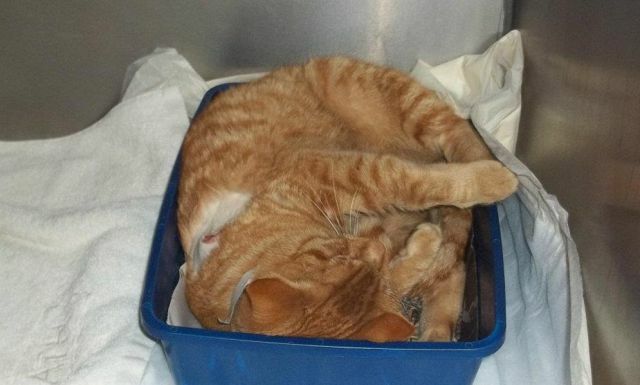 This is a litter box, not a napping space. This just proves that ginger cats do what they want. If they want to nap in their litter, well that is what is about to go down then. Babies snoozing in flower petal bonnets are so ten years ago. Behold kittens in teacups, and not any kittens, our gingery goddesses of the fur! I need this image on calendars, sweatshirts and maybe in a wallpaper print. Give me all the kitties in cuppies! Our favorite colored kitties are truly loved by all species, not just by their human besties. Even this horse gets in on the ginger-lovin' action with a big old barn hug. If an animal was going to ever run for mayor of the farm, this gingery pet would win by a landslide. You get all the votes pal. Ginger-colored kittens cannot take a bad photo; it's a proven fact. Look at this stunner. Even when his image is snapped in his most unprepared moment of life, he ends up looking like he is heaven sent. At this point, I am fairly convinced that this breed of feline can do absolutely no wrong. Well, hellooooo handsome! It seems that you have found a way to wedge yourself in a drinking glass. No worries, we shall save you from yourself and then we shall worship you. You, my friend, might not be the brightest bulb out there, but you still shine in our book. Nope. I will tell you nothing of the sort. You are indeed the king of the gingers, and possibly of all the kitties in the land. That face says I'm fierce and I'm fabulous. Now excuse me while I run off and fashion you a crown. 1 Today is your day Gingers. We celebrate you! Today is truly your day, and we celebrate you ginger kitties of the world. You are full of life, and fluff and your hair is hands down the fairest on all the land. Find yourself an armchair to perch upon and know that you are loved.